Still waiting for the satellite dish to be repaired but thankfully it seems to be a rain-induced problem so on beautiful sunny days like today it works again. So as they are forecasting heavy rain in the next few days I'm trying to 'make a bit of hay' today! What a crazy world of weather we have now and we really do feel for everyone in the northern hemisphere suffering such an horrendous winter of weather (Global Warming ... ??? ), while here in Australia some parts of the country have had enormous floods and other parts devastating bushfires with many homes lost. So if you are dreaming of sun and warmth(!) 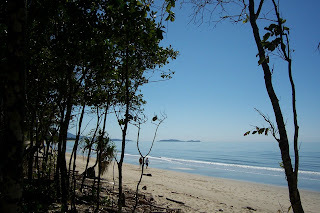 here's a photo taken on beautiful Wonga Beach, about a 15-minute drive from us - those folks were the only ones on the beach - in the distance you can see the two little humps of Snapper Island, an uninhabited island near the estuary of the Daintree River. Very little surf here at any time as we are inside the Great Barrier Reef so the water is very shallow - in fact our coastline here is quite close to the Reef, but it's still about 40-50km offshore and the further south along the Queensland coast you go the further offshore is the Reef. To dive or snorkel or glass-bottom-boat on the Outer Reef is the experience of a lifetime - we are soooo lucky to have it on our doorstep!